Gulab jamun using instant MTR readymade mix - step by step recipe and video. Diwali celebration is incomplete without these yummy Gulab jamun. 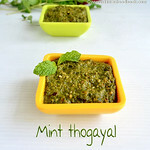 Its an universally loved Indian dessert recipe. In most of the Indian households, Gulab jamun recipe will be in the Diwali sweets menu for sure. Many people make it as the last minute sweet for Diwali and other special occasions like birthday, anniversary, New year celebration and even for Valentine’s day. Most of us opt for Gulab jamun recipe using readymade, store bought Instant mix as its easy and quick to make, cheap in price compared to other sweets in shops.Even though the ingredients used in the gulab jamun mix are the same, there are many brands available in the market with their own variations & style. Some of the most popular ones are MTR, GITS, Aachi, Bambino and Orkay. 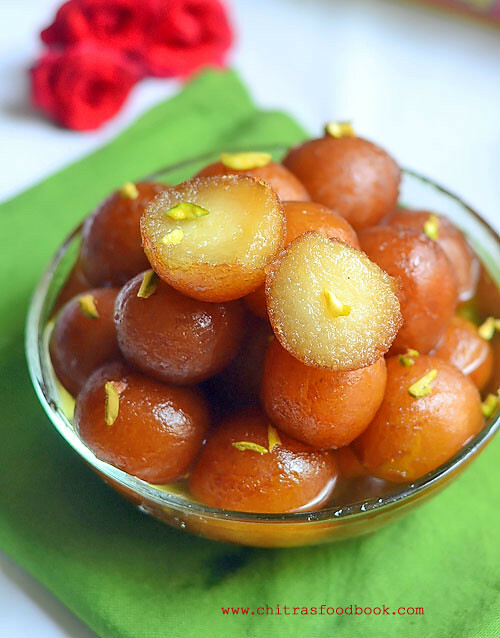 Recently my reader friend Harini requested me to share Gulab jamun recipe using MTR jamun mix. So I bought a pack of jamun mix in buy one get one offer and tried it yesterday by getting some inputs from my friends Tara, Megha and Swarna. They make Gulab jamun using readymade mix very often. So they shared some useful tips to make soft, smooth gulab jamun without breaking and cracks.I watched this YouTube video tutorial as well. 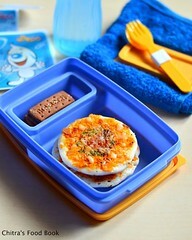 I followed the steps carefully and the result was awesome, perfect !! I was elated to see my soft, Gundu Gundu gulab jamun and jumped out of joy. Raksha and Sendhil relished this yummy dessert recipe with ice cream. Most of you may think, making gulab jamun using instant mix is not a big deal or rocket science. Yes, its true. But beginners may face some difficulties to prepare a perfect Gulab jamun. So this post is explicitly for them. Even bachelors can also give a try. Experts, please excuse me and do share your favorite jamun mix along with some tips if any. Lets see how to make Gulab jamun recipe with MTR instant mix at home with step by step photos and a video tutorial ! Please watch this video for clear understanding ! Read the instructions given on the pack. 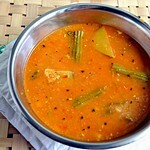 In MTR mix, its mentioned to add 1 part of water for 4 parts of mix. 400gms of sugar for 150 gms mix packet. So i followed the recipe accordingly. Take sugar and water in a wide bowl and mix well. Keep aside, let it dissolve. In the mean time, take the gulab jamun mix in a wide plate. 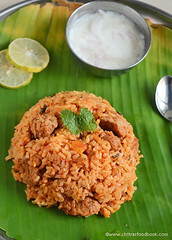 I used my thambalam/ big round plate. 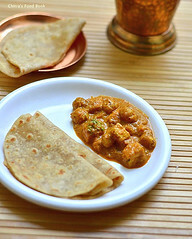 Usually I make chapati dough and other dough in my thambalam as its spacious and convenient to mix well. If the mix has more lumps, sieve it once. Break the lumps with your fingers while sieving. Do not discard the residue. Add it to the mix again. I got around 1.5 cups of powder. If you are using ORKAY mix, do not sieve the mix. Just break the lumps using your hands. Now add the milk little by little and gather all the flour with your fingers. The mixture will become wet and very sticky. Do not worry. Gulab jamun will come out soft if the dough is sticky. I used 1/4 cup + 2 tbsp + 1 tsp milk. So add milk carefully at the end. If you add more milk, jamun will flatten and break. Do not knead the dough using your palm.Mixing should be done only with your fingers. Cover the dough with a plate or invert a bowl. Let it rest for 15 minutes to 1 hour. In the mean time, heat sugar + water and melt it. Add saffron threads, cardamom or rose essence. Boil the syrup for 10 minutes in medium flame till the syrup turns slightly sticky to touch, glossy & resembles oil in consistency. Keep aside. Let the syrup becomes warm. After 30 minutes, take the dough.It will be soft to touch.Do not knead it. Grease your palm with ghee. Make a big gooseberry sized ball by rolling the dough between your palm. Give gentle pressure and roll it continuously for 30 seconds to make it smooth and crack free. As the dough is sticky, jamun balls will not get cracks. If you feel there are cracks, just roll it tight. Cracks will disappear. I made around 20 balls. If the sugar syrup becomes cold, heat till it becomes medium hot. i.e vapor should start to come from the syrup slightly. Deep fry all the balls in batches, drain in the tissue and drop in the syrup. Let the balls soak in syrup for minimum 3-4 hours. It will soak well and double in size. Remove and serve in a bowl. Transfer the gulab jamun to a tight box and store it for days.No need to refrigerate. Adding milk for making the dough helps to give soft jamun. You can use water as well. 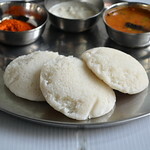 My friend Swarna adds just a tsp of milk in the beginning and add then water to make the dough. Dough should be really sticky to get soft Gulab jamun. If you have added more milk by mistake, don’t panic. Just cover the dough with a lid and let it rest for an hour.Grease your hands and make smooth balls.If it comes out without cracks, then proceed and deep fry only one ball for a trial. If it disperses in oil, then add a tsp of maida, mix well and make another ball. Test it and proceed further. But adding more milk flatten the jamun. So please be careful while adding milk. Jamun balls should be crack free. Roll it for 30 seconds continuously.This helps to seal the cracks while rolling. Do not press it too hard while rolling, but give gentle pressure. Deep fry the balls only at low temperature else balls will get browned quickly without cooking inside. 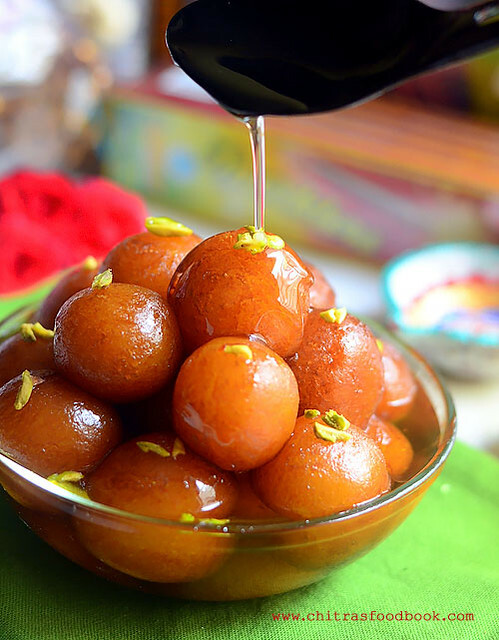 Gulab jamun balls will disperse in oil or cracks more if the oil temperature is too low. So Check the temperature before you drop the balls. Similarly cracks will form if the jamun balls become dry.so keep it covered all the time till you finish the procedure. Sugar syrup should not be too hot while you drop the jamun. It should be medium hot or warm. Similarly Gulab jamun should not be too cold. Gulab jamun will flatten if you add more milk. It will also flatten if the sugar syrup is less. Make sure the sugar syrup is enough for all the balls to absorb and dunk in completely. If the quantity of sugar syrup is less, then jamun will not turn soft and double in size. 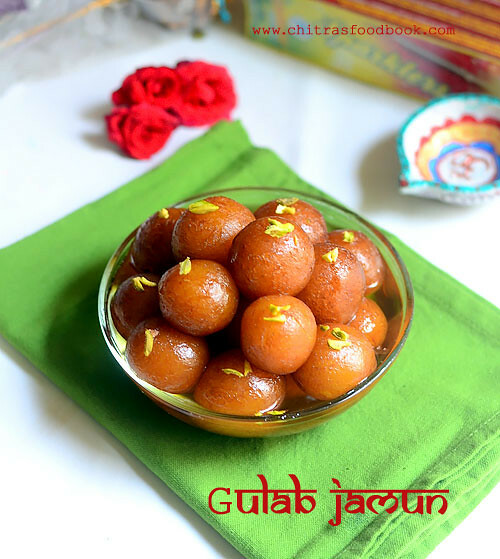 Try this delicious, yummy cute Gulab Jamun recipe for your Family and have a great Diwali Celebration. Wish you all a very happy and safe Diwali !! 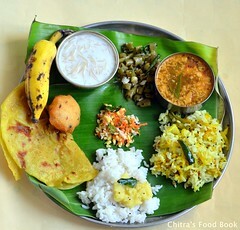 Hi chitra thanks for posting. Tomorrow I ll try and give u the feedback. Jamuns are so beautiful and tempting. Hope I ll also get the same. Sure Harini. You will get it perfect 😊 All the best ! 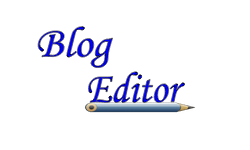 Hi Chitra Thanks for the post. 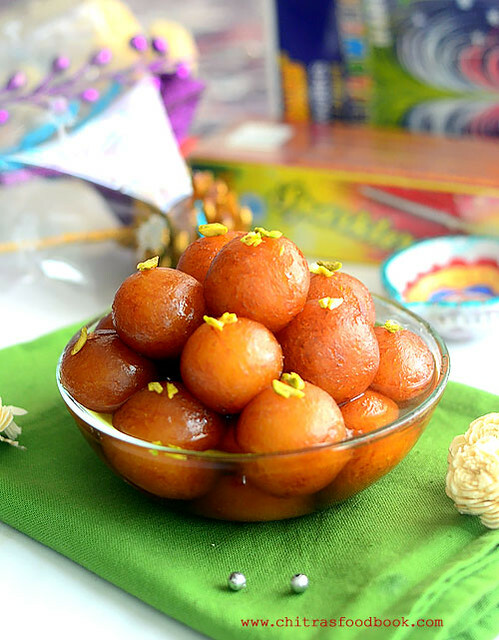 Gulabjamuns look fantastic. I am interested to know about the bowl in which you made sugar syrup - could you give the details please? Thanks. hi chitra,i made gulab jamuns using mtr mix and it came out very well using your method and tips.previously i was using very less water for mixing the dough and the dough was not at all sticky hence the cracks.now i got the point.thanks for posting the recipe and the tips.hope u celebrated deepavali very well.i was too busy that i cant come and wish u here. Thanks for the feedback Harini 😊 Glad i could help you! 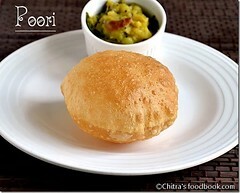 Hi Chitra, Love the look of your soft-smooth Jamoons. I have Gits instant mix and the water/milk quantity suggested is about 1/4 cup. Should I stick to the instructions on the pack or can I increase it to the quantity you have mentioned for the MTR mix ? Also, the instructions on the pack suggest milk (1/4 cup) instead of water for richer taste. Since my Jamoons usually have cracks (after rolling), I wanted to check with you. 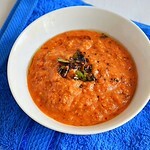 Milk is the better option Anusha :) Add 1/4 cup as mentioned. If the dough is hard, add 1 - 2 tsp more and make it slightly sticky as mentioned here. Rest for 5 minutes, then roll it. Cracks can be avoided :) Hope it helps ! jamuns with ur method.it came out well this time also. Tried this today.. Wow.. Came out so well. Round n perfect jamuns..������.. Can v reduce the sugar amount?? Thanks a lot for the feedback 😊. Yes you can reduce if the quantity of syrup is more. Thank you. I wish to share the picture of jamun with u. Can i have ur email id.. I got lot of apprecition from my friends. Can i use 2 cups of sugar instead of three?. . Please advise. Yes you can add 2 cups of sugar and 3 cups of water to reduce the sweetness. Please mail your pictures to chitra.ganapathy@gmail.com. I am eager to see it :) Thanks again for your wonderful feedback.